Search for Jenny Lind in CBW. Find Jenny Lind on the Pop Chart. In daguerreotypes, Jenny Lind today strikes us as unexceptional: modestly plain (if not homely), with a serene, even reserved countenance. This unassuming Swedish woman was an international opera sensation in the nineteenth century. Our inability to hear her voice or witness her dramatic power may explain why her fame has faded away. Biographers who wrote tributes to the opera singer during her career describe her performances with manifest emotion, giving us an indication of her captivating presence on the stage. Known as the “Swedish Nightingale,” she began in lower-class obscurity and rose to become recognized by royalty as an indigenous treasure. On concert tours, overwhelming crowds thronged to greet her arrival; and, after a show in London, even Queen Victoria threw a bouquet down to her from the royal theater-box (Rosen). She remained humble in the midst of celebrity and is esteemed alongside great women of prosopography for her vocal talents as well as her charitable example—after retiring professionally, she gave free concerts to raise donations for hospitals and the needy. Rediscovering her through written accounts, along with a wealth of popular-culture materials, including ephemera, cartoons and advertising campaigns, creates a picture of an exceptional figure whose biography intersects with issues of class, the arts in society, and public women. Here, the stature of the great woman seems out of proportion with the public’s terms of intimate affection. Her rise to that stature is all the more remarkable in light of the lack of love or “affectionate diminutives” that she received during her neglected and impoverished childhood. Johanna Maria Lind was born on October 6, 1820 in Stockholm, Sweden, the daughter of working-class Niclas Jonas Lind (1798-1858) and Anne-Marie Fellborg (1793-1856). She was considered illegitimate until age fourteen when her parents were wedded, a second marriage for her mother. Niclas, five years his wife's junior and only aged twenty-two at Jenny's birth, was the unambitious son of a successful lace-manufacturer, who failed in the business when it passed on to himself. He held an unprofitable bookkeeping position and was unable to provide enough income to support his family, but is described in biographies as “good-naturedly weak; much given to music of a free and convivial kind” (Holland and Rockstro 12). While Jenny may have inherited her father's musical inclinations (he was an amateur singer in community festivals), she certainly possessed none of his weakness of character. The single-minded determination she later exhibited in training her voice for opera is a trait to be found in her mother. Anne-Marie came from a respectable family and was well-educated, qualities which enabled her to earn a living as a schoolmistress when Niclas proved incapable of providing for her. In 1820, she was running a day-school for girls out of their home, where two of the students also boarded. Occupied with the financial concerns of the household, the mother gave the new baby little welcome and soon placed her daughter in the care of strangers. Until 1824, Jenny lived in the countryside with a couple, a parish-clerk and organist and his wife. While she was neglected by her parents in early childhood, this was not an entirely unhappy period of her life. Listening to the songs of wild birds, she felt an intense love for the Swedish countryside that she retained even as an accomplished opera singer—a national “instinct…native to the Swedes,” according to biographers. The passion for “the country” had “deep-rooted dominion” over Jenny Lind, and in turn she personified country folk. During her musical career as the “Swedish Nightingale,” this indigenous quality was cherished by international audiences of all ranks and the combination of homeliness and powerful feelings which she displayed in performance was part of her common appeal. While Jenny's years in the countryside made a lasting impression, they were short-lived. In 1824, she was brought back to town and for a period of time, lived with her grandmother in a respectable almshouse for the widows of Stockholm burghers. Here, she received affectionate care and was taught a sense of religion and morality which guided her later charity work. Her grandmother was the first to recognize the small child's musical abilities, overhearing her one day at the piano and thereafter, her natural talent was celebrated by neighboring widows who came to hear her sing. Around 1828, her mother's day-school closed and economic constraints once again disrupted Jenny's home-life. She was handed over to the care of a childless couple who had placed an advertisement in the paper for a child to come live with them. The husband was the steward and tenant in the lodge-house of the same almshouse where her grandmother lived, so happily, she was not removed from all familial relations when her mother left Stockholm shortly after to take a governess position. However, in this couple's guardianship, she spent many hours alone and a cat became the audience for her songs. The clear, high voice carried to other ears, and one of the people who heard from the street changed the course of Jenny's life. There was once a poor and plain little girl dwelling in a little room, in Stockholm, the capital of Sweden. She was a poor little girl indeed then; she was lonely and neglected, and would have been very unhappy, deprived of kindness and care so necessary to a child, if it had not been for a peculiar gift. The little girl had a fine voice, and in her loneliness, in trouble or in sorrow, she consoled herself by singing. In fact, she sung to all she did; at her work, at her play, running or resting, she always sung. When the discernment of Jenny's talent originates with the lady, the story can be placed in a neatly defined package. The woman of a better class provides charitable assistance to one of the less fortunate class: a secure hierarchy—as opposed to the destabilizing potential when a servant assists a poor girl to rise to the level of renown that is recognized by royalty, her name is on the lips of kings and queens. This presenter elects to replace Jenny's name with “(poor) little girl,” and inflects the story with such pathos that ones can see the tendency towards reducing her to “endearing diminutives” which Holland and Rockstro suggest obscured the public's recognition of her rare and intense artistic talent. The maudlin affect veils the slippage between class and status boundaries—what I consider to be the most critically significant part of her biographical story—in the 'once upon a time' of fairy tales. Although the head of the Royal Theater of Stockholm nearly rejected Jenny when he saw her—“a small, ugly, broad-nosed, shy, gauche, under-grown girl!” (a self-description from one of her letters)—she was accepted at the Royal Opera School after he was moved to tears by her voice (Holland and Rockstro 18). There, she found her home on the stage. The Royal Theater assumed guardianship of her and she was brought up, educated and received vocal training at the expense of the government. By age ten, she made her first appearance singing and dancing on stage and continued to play children's parts in productions. Yet at adolescence, her voice changed; it lost the clarity and high tone which had received so much praise. Several years passed before Jenny would gain the chance to debut in the theater of Stockholm; however, with determined study she mastered the new quality of her voice. Such a trial would occur again at the height of the opera singer's career, when she lost her voice and had to learn how to retrain it before she was able to return to performing. Her commitment through this early ordeal signaled that she had taken on singing as work. No longer the little girl who was discovered to have such talent, Jenny Lind had claimed for herself the place of a serious professional artist. On March 7, 1838, audiences made a sensation of her performance as Agathe in Carl Weber's Der Freischütz. This was the first great role of Jenny's many onstage triumphs and made her a favorite of the Royal Swedish Opera. At age 20, she was accepted as a member of the Royal Swedish Academy of Music and was appointed as a court singer to the royalty of Sweden and Norway. However, her popularity strained her voice; over-exertion left it sounding harsh. Determined again to save her musical powers, she traveled to Paris seeking Manuel García, the famous baritone who became a vocal instructor for the Paris Conservatory, and later, the Royal Academy of Music in London. Before forbidding her to sing a note for three months, he famously told her: “My dear child, you have no voice. Or, you have had a voice and are just going to lose it” (Lind-Goldschmidt 13). The period of silence repaired her voice, and nearly a year's tutelage under García saved the opera-singer's career. When Jenny returned to the stage, audiences were not fickle to their one-time favorite, but immediately embraced her again. Along with novelist Fredrika Bremer, Jenny was intimate with many significant figures of literature and music, including Hans Christian Andersen, sculptor Georg Jensen, and composers Mendelssohn, Chopin, Meyerbeer, and A.F. Lindblad, “the Schubert of Sweden” (Holland and Rockstro 4). Although she appeared unsophisticated, the dramatic range of the roles she played mirrored a depth of character which many found to be personally, as well as artistically, engaging. These relationships showed her to be exceptional in several ways: she was of the lower class yet many recognized an inherent sense of refinement about her; she was a popular entertainer yet recognized by cultured members of society as an artist of their own kind; and she was a woman of the Victorian era publicly accepted into the company of men. One biography notes the admiration Jenny's character won amongst serious minds: “Its peculiar force lay in this—that it held enthralled the highest and best minds in Europe. It was the men of genius who recognized in her something akin to themselves” (Holland and Rockstro 4). In her late twenties, she was inducted as the only female member of a student fraternity in Göttingen, Germany called Burschenschaft Hannovera. Amongst the men of this classical German organization she was fondly known as “Little Lady Jenny”—endearing diminutives were attached to her name even as she was distinguished from a commonly recognized form of femininity (Holland and Rockstro 375). For some of those who knew Jenny, esteem for her rare character and intellect developed into romantic interest. Her fine grey eyes and sincere nature captured the heart of Hans Christian Andersen when he met her during a concert tour of Denmark, prompting him to write two of his most famous stories in her honor, The Ugly Duckling and The Nightingale, the source of her stage name the “Swedish Nightingale.” She was also an inspiration for Mendelssohn as well as Chopin, both of whom composed operas with her voice in mind. While nineteenth century biographies acknowledge her professional relationships with these two men, a more intimate association was not considered until new biographical information surfaced that could unsettle some revered reputations. Professor Curtis Price (formerly of the Royal Academy of Music in London) claims in a recent biography on Mendelssohn that the married composer was desperately in love with the singer. Price alleges that in 1847, Mendelssohn begged her to elope with him and threatened suicide upon her refusal. A few months later, Mendelssohn was, in fact, dead; however, this scandal of musical history remains a speculation since the documents were sealed by an affidavit secured by Lind's husband in 1896. Jenny's requited romance with Chopin has been publicly substantiated, though only very recently has it been discussed in biography. Evidence shows that she obtained Queen Victoria's approval to marry him 1849. The union never occurred because Chopin was fatally ill, but Jenny is said to have sung at his bedside while the composer was dying. On February 5, 1852, while touring America, she married pianist Otto Goldschmidt (who had been one of Mendelssohn's pupils), becoming a new bride at the rather late age of thirty-one. Jenny's American concert tour greatly increased her fame, but her association with P.T. Barnum, who financed the tour, had an unfortunate impact on her reputation. Under the strain of continuous performance, the exhausted singer was considering a transition to retirement, wanting to commit herself to benefit appearances only. Barnum convinced her to make a tour of America by promising that she would earn enough money to pay for her retirement and fund her project of establishing several new schools in Sweden. Counting on the extraordinarily high ticket sales of her tours in Great Britain, the self-titled “Greatest Showman on Earth” introduced the “Swedish Nightingale,” hitherto unknown by American audiences, in advertisements touting her moral purity and social benevolence as much as vocal talent. He began publicizing the tour half a year in advance of her arrival, citing the free benefit concerts she had given as a promotional tool to increase his profits from the 150 shows she was contracted for (after 93 performances, she ended their agreement). While Jenny donated nearly all of the $250,000 she made during the tour, Barnum's commercial exploitation muddied what, for her, was a genuinely altruistic use for her immense celebrity. Critics focused on the spectacle made of and by her in the United States and her charitably intended tour was repeatedly parodied in the press. A cartoon by New York engraver William Schaus entitled “Panorama of Humbug” (1850) satirizes the extent of the advertizing campaign that Barnum orchestrated to launch the “Swedish Nightingale” to popularity before she even sang a note for an American audience. 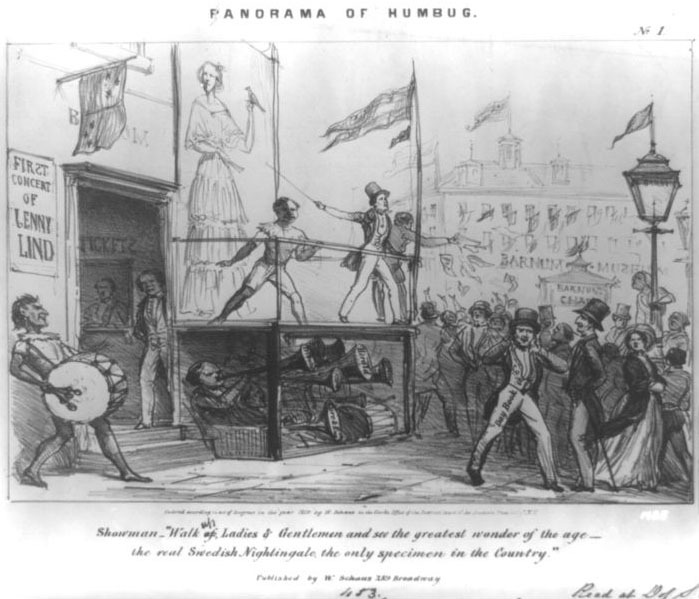 It shows the public frenzy that greeted her arrival being created by showmen campaigning on the street as Barnum watches from behind a curtain in an inconspicuous corner of the picture. A colossal image of Jenny, nightingale perched in hand, dominates the background and immediately draws our eye to her; an optical effect which ironically mimics the humbuggery being scrutinized. The cartoon shows the friction between her marketability as an eminent figure and her efforts to make philanthropic use of her eminence. At the same time, her hugeness in the picture suggests another reading: that Barnum's puffery as unnecessary because the reputation which earned her such public stature served as its own advertisement. The approval Barnum generated for the singer before audiences even heard her voice corroborated claims from across the Atlantic that the taste of the American public was guided by popular opinion rather than refined discrimination. 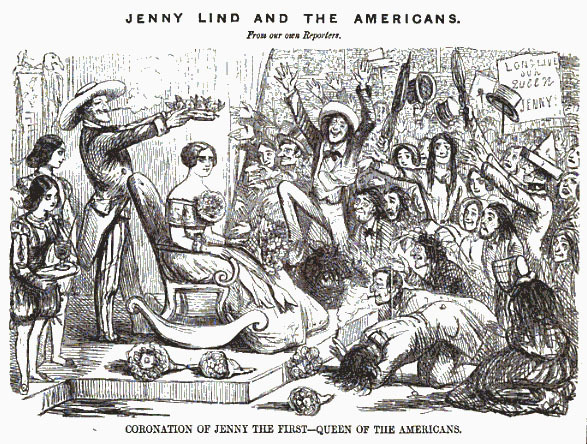 A cartoon called “Coronation of Jenny the First—Queen of the Americans” (1850) which appeared in Punch is a satirical comment upon the lack of sophistication amongst her American fans. Before a raucous and apparently low-classed crowd of people, some prostrate in homage, some whooping and leaping, sits Jenny, being crowned as their popularly elected Queen. Paradoxically, the reference to her royal associations reminds us that the high shared their appreciation of her with the low, challenging the association between lack of taste and lack of status. As though she were Victoria, whom the cartoon rendering immediately calls to mind, Jenny's countenance is as gravely sober as if she were being charged with royal responsibilities. Imaging her as a double for Victoria (even though it was intended to be a parody) encourages us to consider these two women collectively, as both were in highly public positions at the same time as they were figures of feminine virtue for an emerging middle-class ideology. The effect of collecting forms of womanhood is present in another cartoon titled “To Jenny Lind, From Punch,” which makes satire of one of the only public roles that Victorian women could engage in without compromising their femininity: charity work. Jenny is shown in the middle of the picture holding a basket of food—an object symbolizing the charitable woman's mission. She stands in a Madonna-like pose, her eyes are downcast, her arm and hand extended to comfort the impoverished crowd of shoeless wretches and mothers bearing infants, who kneel in a circle at her feet. This exaggerated portrait of the ministering angel parodies Jenny's philanthropic activities; yet at the same time, the cartoon's figure for satire runs up against prosopography, which uses the same topos image to present genuinely worthy heroines as models for women's public contributions. Many of the ministering figures found in collected biography shared the mission of charity work and Jenny, who donated concert proceeds to Florence Nightingale's Nursing Fund at the end of the Crimean War, provides us with an example of one heroine supporting a cause championed by another. Although she continued to give performances to raise money for the needy, Jenny retired from her professional stage career when she completed the concert tour of America in 1852. The Goldschmidts settled into the calm of domestic life and raised two sons, Walter and Ernest, and a daughter who shared the same endearingly diminutive name as her mother. In 1883, Jenny gave her last charitable performance and during the same year, her vocal talent received one more public acknowledgment when the Prince of Wales appointed her as the first professor of singing at the newly established Royal College of Music. On November 2, 1887, Jenny died of cancer at her home in Wynd's Point, England. Although this phenomenal celebrity of the nineteenth century has been largely forgotten today, evidence of her popularity is preserved in an incredible amount of material culture from the era. Her name and image can be found on everyday items from cigar boxes, hard liquor, perfumes, plate ware, tea sets, furniture, pastry recipes, even train cars. Jenny's legacy as a professional artist earned her a place in high culture alongside her male peers. Near Handel's statue in Poet's Corner at Westminster Abbey, a plaque is dedicated in honor of her musical accomplishments. 1 William Schaus, “Panorama of Humbug” (New York: W.Schaus, 1850). 2 “Coronation of Jenny the First—Queen of the Americans.” Punch 19 (1850): 146. Holland, Henry Scott, and William Smyth Rockstro. Memoir of Madame Jenny Lind-Goldschmidt: Her Early Art-Life and Dramatic Career, 1820-1851. Vol. I & II. London: J. Murray, 1891. Lind-Goldschmidt, Johanna Maria. Memoir of Jenny Lind. London: John Olliver, 1847. Rosen, Carole. "Lind, Jenny (1820–1887)." Oxford Dictionary of National Biography. Ed. H. C. G. Matthew and Brian Harrison. Oxford: OUP, 2004. Willis, Nathaniel Parker. Memoranda of the Life of Jenny Lind. Philadelphia: Robert E. Peterson, 1851. A reading of the gender and class issues which intersect with Jenny Lind's life, based on prosopography sources as well as nineteenth- century popular-culture materials. "The Jenny Lind Archive." Center for History and New Media: The Lost Museum Archive. From the Jenny Lind exhibit on The Lost Museum website, this archive of materials contains newspaper articles, concert advertizements, portraits, cartoons, and memorabilia related to the singer. The Jenny Lind Archive is linked through George Mason University's Center for History and New Media webpage. Carole Rosen, "Lind , Jenny (1820–1887)." Oxford Dictionary of National Biography. Ed. H. C. G. Matthew and Brian Harrison. Oxford: OUP, 2004. Oxford Dictionary of National Biography entry on Jenny Lind written by Carole Rosen. This comprehensive biographical record includes a list of other sources and archive materials related to Jenny Lind. Charles G. Rosenberg, Jenny Lind: Her Life, Her Struggles, and Her Triumphs. New York: Stringer & Townsend, 1850. Charles G. Rosenberg's biography about the life and career of Jenny Lind. Full-text edition linked through Google Books. Henry Scott Holland, and William Smyth Rockstro, Memoir of Madame Jenny Lind-Goldschmidt: Her Early Art-Life and Dramatic Career, 1820-1851. Vol. I & II. London: J. Murray, 1891. 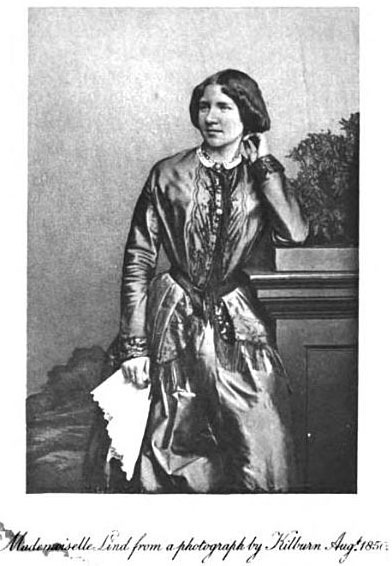 Henry S. Holland and William S. Rockstro's comprehensive biography about Jenny Lind, based on her letters, journal entries and other documents collected by her husband, Otto Goldschmidt. The memoir is published in two volumes and contains the authors' preface as well as several illustrations. Full-text links to Vol. I and II accessed through Google Books. Johanna Maria Lind-Goldschmidt, Memoir of Jenny Lind. London: John Olliver, 1847. The memoir of Jenny Lind, which covers her career as well as her personal character. Also included are excerpts from the letters of influential music masters who discuss Jenny Lind's voice and artistic talent. Full-text edition linked through Google Books. Nathaniel Parker Willis, Memoranda of the Life of Jenny Lind. Philadelphia: Robert E. Peterson, 1851. Written while she was still performing onstage, Nathaniel P. Willis' biography about Jenny Lind celebrates her musical accomplishments. Willis provides letters and ancedotes about Jenny Lind to better aquaint her adoring audience with the story of her life. Full-text edition linked through Google Books. William Smyth Rockstro and Otto Goldschmidt, Jenny Lind: A Record and Analysis of the 'Method' of the Late Madame Jenny Lind-Goldschmidt. London: Novello, 1894. William S. Rockstro discusses the vocal method employed by Jenny Lind. The second part of the volume, edited by her husband Otto Goldschmidt, contains facsimiles of musical scores showing the notes as sung by Jenny Lind and descriptions of her onstage performances of these songs. Full-text edition linked through Google Books.